The blessing and curse of giving games as gifts is variety. There are a lot of games out there to choose from, and pairing the right box with the correct beloved can sometimes be trying. Worry not, dear readers – use the Dice Hate Me Holiday Game Guide to aid you in your shopping the next few weeks. Each one of these has been hand-selected and personally-tested to guarantee goodness. May you always roll sixes and may your resource cubes be plentiful. Happy Holidays! People tend to underestimate their mothers. It’s important to remember that beneath many of those quiet, apron-clad, cookie-toting exteriors beats the heart of a warrior. She did, after all, tell your third-grade teacher that it wasn’t your fault that you were smarter than the teacher. She did, after all, threaten to boot stomp five high-schoolers who were pushing around the sixth graders. Even if she doesn’t always act like it now, your mom wants the win. For my mom, that means flicking little wooden discs around a big track for hours on end. Granted, my mom likes and watches NASCAR, but this is balanced out by the fact that she seems to have the same flicking dexterity as my 9-year-old cousin – which is pretty cool, because they can both play on the same level! 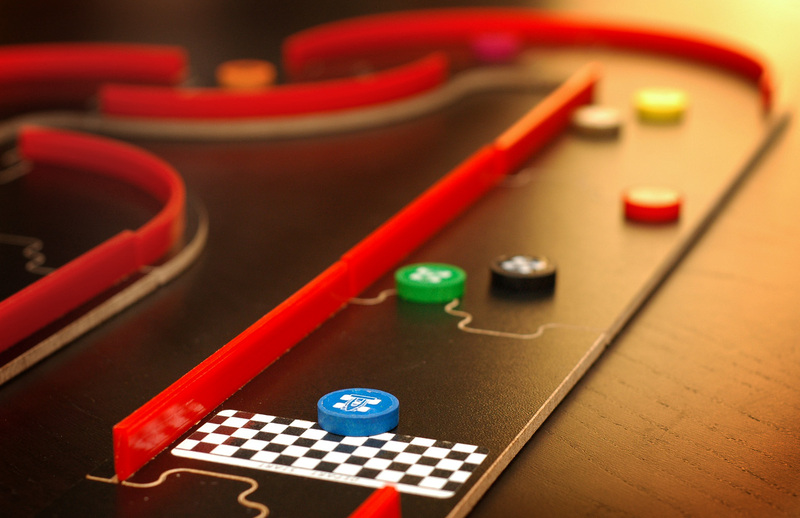 This holiday season, don’t underestimate your mom; get her heart racing again with PitchCar. And might I recommend PitchCar Mini? It’s a bit easier to fit underneath the tree. PitchCar Mini is a game for 2-8 leadfoots, ages 8 and up, by Jean du Poël for Ferti and distributed by Eagle & Gryphon Games. You can purchase it online for $54.99 at eaglegames.net or at your favorite local game store. For more information, check out the Dice Hate Me review! Theme versus mechanics is a pretty heavy topic amongst more than a few boardgamers. Many of the Ameritrash crowd complain that Euros are nothing more than mechanical constructs with paper maché hastily attached, and many cube-pushing Euro gamers have no problem telling Ameritrashers that they should just go see another Bruckheimer film instead of trying to play an 8-hour-long battle reenactment with little plastic army men. Which side is right? For the holidays, it doesn’t matter, because Alf Seegert has designed a game that incorporates both theme and gameplay seamlessly. Based on Chaucer’s bawdy Canterbury Tales, and filled with both tactical cube-pushing and take-that punkery, this is a game that any literary elite would be proud to have on their book-filled wooden shelves – and that their less pulp-minded friends won’t mind playing with them. 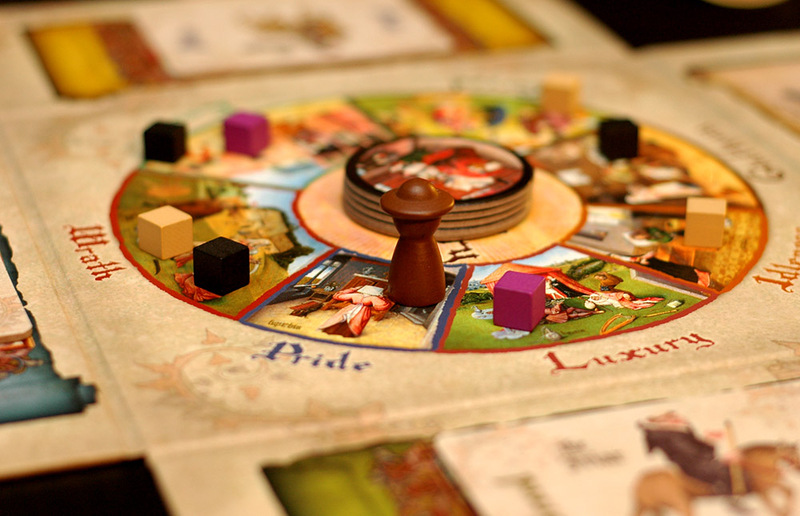 The Road to Canterbury is a game for 2 to 3 Pardoners, by Alf Seegert for Eagle & Gryphon Games. It retails for $59.99 on the Eagle & Gryphon Gamessite, or you can ask your favorite local game store to pick up a copy for you. For more information, check out the Dice Hate Me review! There are plenty of great combinations in this wonderful world: chocolate and peanut butter, hot dogs and the ballpark, surf and turf… The Captain and Tenille. None, however, can hold a candle to beer and boardgames. As an avid beer enthusiast – and the plethora of pubs we traverse in order to imbibe regularly – I personally never leave home without No Thanks! It continues to be the perfect bar game – quick to explain, easy to play, and infinitely scalable in relation to everyone’s public drunkenness. I have yet to meet a single person, whether a diehard gamer or not, that has not enjoyed the thrill that this amazingly simple game provides, and in just the right situation, it can prove to be the ultimate icebreaker. So if you have a friend in mind that likes a little sass with the sauce, delight them with this pocket full of perfection. No Thanks! is a game for 3 to 5 gamblers, by Thorsten Gimmler for Z-Man Games. It retails for $8 on boardgameguy.com, or you can pick it up at your favorite local game store. For more information, check out the Dice Hate Me mini-review! Nothing says holiday cheer like giant monsters wreaking havoc on an over-populated Asian city, am I right? Even if you don’t quite understand the sentiment in that statement, I’d bet dollars to donuts that quite a few geeks on your list would feel the same way. At any rate, King of Tokyo may be one of the best casual games of this past year, and even if dice cause you as much terror as giant bionic gorillas, chances are you’ll be throwing the bones with wild, gleeful abandon after one play. The main gist is this: Choose one giant monster, roll some dice, choose whether you’d like to attack with or gain “destruction” points with said dice, gain power from said dice, spend energy gained from power to buy cool power-up cards such as Extra Head or Giant Brain, and ultimately try to destroy all other monsters or gain 20 “destruction” points. Everyone involved (2-6 players) fights over who gets to bash Tokyo each round and, thus, earn more destruction points. With tons of special power cards and dice that can cash and bash, this game should get anyone past their fear of those cruel cubes of fate. 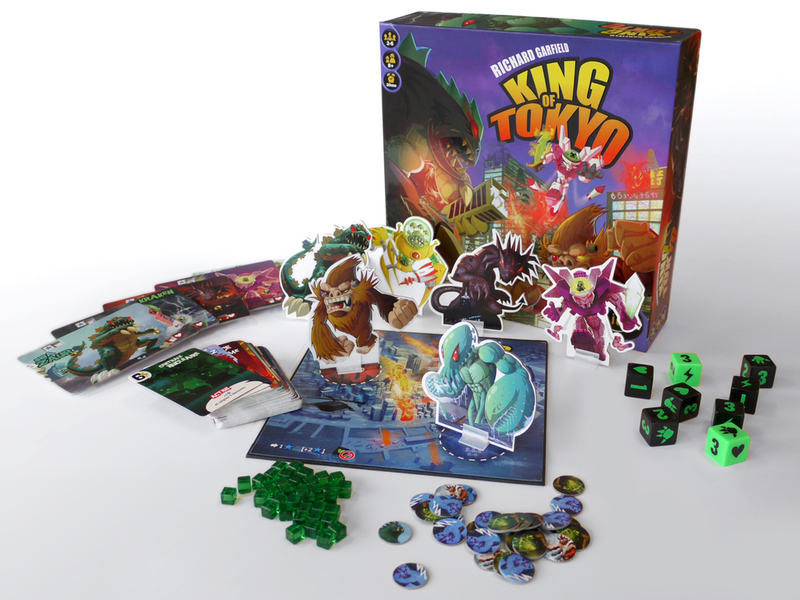 King of Tokyo is a game for 2 to 6 little monsters, by Richard Garfield for Iello Games. It retails online for $28.50 from boardgameguy.com, or you can ask for it at your favorite local game store. Despite what a few game critics might tell you, Defenders of the Realm is made of pure awesome. I know, I was a skeptic at first, but after I first played the game with designer Richard Launius and embraced it for all its wondrous qualities without worrying about the endless comparisons to Pandemic or the throwback Larry Elmore art, I knew it was a winner. I brought it home to Monkey238 and converted this fantasy-loathing, elf-taunting cube-pusher into a bonafide fan. So, with that said, imagine what would happen if you gave this game to a Dungeons & Dragons player? I can already hear a few heads exploding from the distance. Yes, the game is expensive. Yes, it takes a long time to play. But you know what? So does D&D. So if you have that special someone in mind that keeps dragon statues scattered about the house or has a longsword in the trunk of their car “just in case,” then Defenders of the Realm is the game for them. 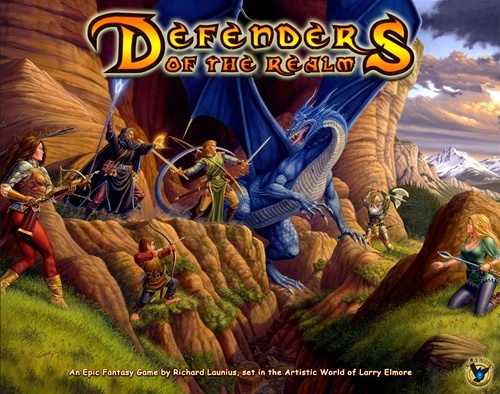 Defenders of the Realm is a game for 1 to 4 heroes, by Richard Launius for Eagle & Gryphon Games. It retails for $85 at eaglegames.net, or you can pick it up at your favorite local game store. 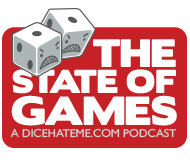 For more information, check out The State of Games podcast with guest Richard Launius! We’ve mentioned this somewhat-unsuspecting card game on The State of Games a few times, and it continues to remain a favorite. The gameplay can almost be described as “spades on steroids” – which is to say that Chronicle is the ultimate trick-tacking game with a huge twist. The goal is to accumulate 3 Fame tokens throughout the course of play, but in order to do so, you must be wary of the specific goal of each turn. These goals can range from gaining the least points in a particular set or accumulating all the cards that are marked as “evil” – basically, the equivalent of shooting the moon in Hearts. The base mechanics of the game are steeped in card tradition, but it’s the fresh twist on taking tricks that makes Chronicle a welcome and valuable edition to any game collection. 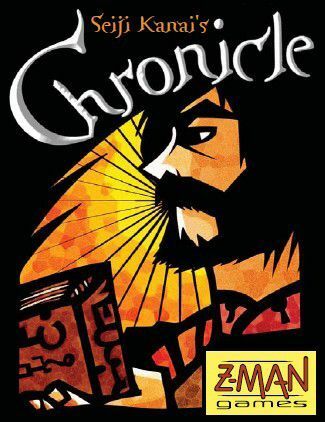 Chronicle is a game for 3 to 6 card sharks, by Seiji Kanai for Z-Man Games. It retails for $6.50 on boardgameguy.com, or you can pick it up at your favorite local game store. 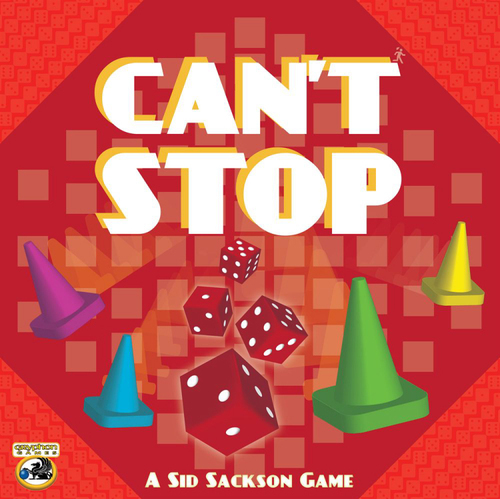 Can’t Stop is a game for 2 to 4 dice chuckers, by Sid Sackson for Eagle & Gryphon Games. It retails for $39.99 on eaglegames.net, or you can pick it up at your favorite local game store. For the many that have asked, I have described Mystery Express as “Clue on crack.” I will always stand by that seemingly-throwaway description. However, if you get down to the nuts and bolts of things, Mystery Express is light years ahead of Clue. Not only are you able to easily travel from car to car on the Mystery Express after the murder has taken place, you can also sniff out the murder/motive trail with some diligence, tactics and just a bit of luck. Most everyone will do just fine coming up with three of the four required circumstances surrounding death; for those of you who are married to/friends with/roommates with an Asian with a propensity for spreadsheets and labels, I bid you the best of luck, and a small penance of pity when it comes to determining Time of Death. 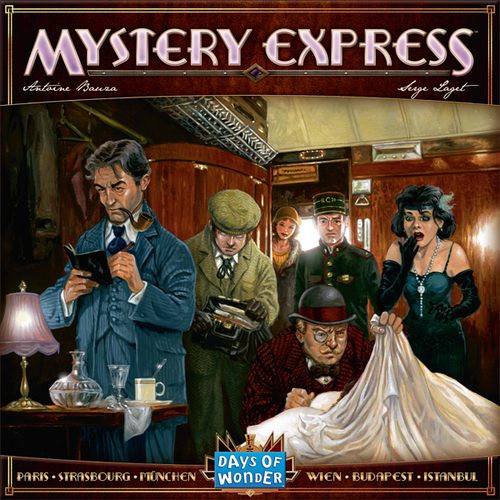 Mystery Express is a game for 3 to 5 master sleuths, by Antoine Bauza and Serge Laget for Days of Wonder. It retails for $33.50 at CCG Armory, or you can ask for it at your favorite local game store. Some of you may ask why I recommend this for those who have a member of their family that is always at odds with one another. If they are constantly fighting, then why would they need a boardgame to get in the way? Mostly because almost any quarrel or disagreement can be settled by a shark. 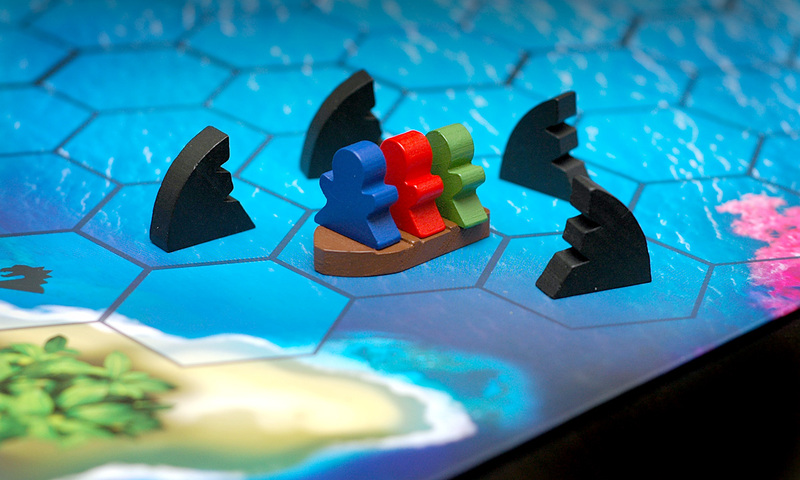 A meeple-eating shark, that is – and, quite frankly, that is funny. This reprinted classic boardgame of the 80s conjures up some amazing nostalgia for a whole generation of gamers, and makes for an easy way for families and groups of varying personalities to gather together to view an island in peril – just in time to survive it. Survive is a game for 2 to 4 atlanteans, by Julian Courtland-Smith for Stronghold Games. It retails for $39.99 at Funagain Games, or you can ask for it at your favorite local game store. For more information on Survive, check out the Dice Hate Me mini-review! If you’re faced with choosing a gift for the gaming geek that has 10 shelves worth of games, ranging from UNO to Die Macher, you’re going to need to pull out the big guns in order to surprise them. 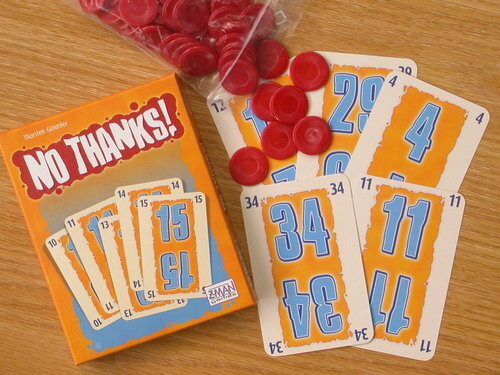 Good ‘Ol Punchin’ Planes is definitely your answer; it’s doubtful that your gamer has ordered it, and it comes with more components than the tiny box belies. Punchin’ Planes is the creation of upcoming VivaJava designer TC Petty III, and he has painstakingly recreated the glory days of boxing on the wings of bi-planes when machine guns and missiles were merely a military dream. It’s a bygone era – mysteriously absent from wikipedia. Darn those media! 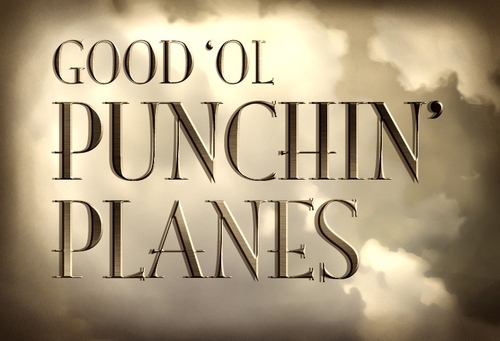 Good ‘Ol Punchin’ Planes is a game for 2 daring pugilist pilots, by TC Petty III. You can pick it up online at The Game Crafter for $10.99. Ok, so I’ve eagerly plugged a lot of other good projects during the year, and quite a few that fit the end-of-year shopping/stealing that’s currently going on… so now, ‘tis the season for selfish plugging: Buy Carnival. Carnival is your friend. Carnival is that knock on the door late at night when you’ve eaten one and a half bags of popcorn, plus some Ben & Jerry’s, and are forced to watch Love, Actually for the fifth time. Carnival is that righteous dude that always shows up to spot you while you’re in gym. So by now, most of you know how to play. For those that don’t, feel free to look at the online tutorial. And remember: there’s still time to get Carnival for the holidays; simply go here (http://shop.gamesalute.com/collections/dice-hate-me-games/products/carnival) and place your pre-order. That way Santa knows where to send the cotton candy. 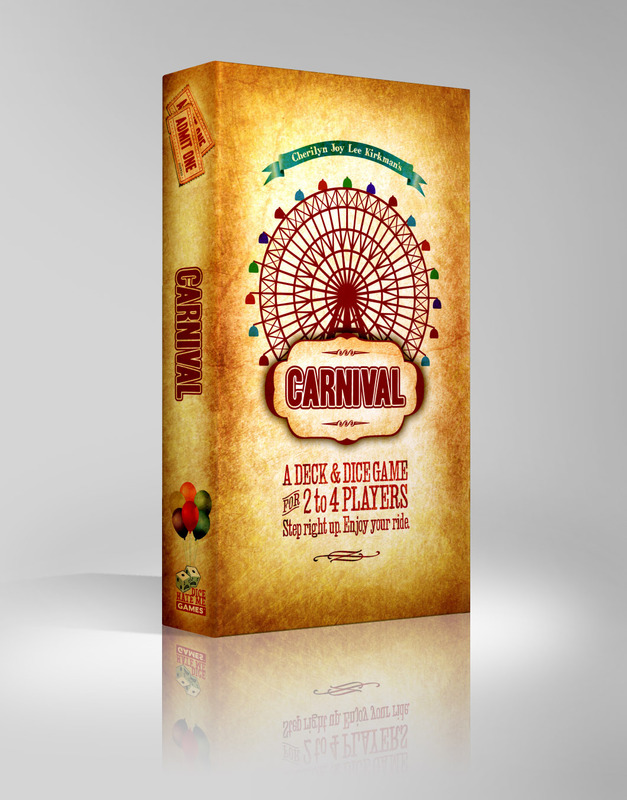 Carnival is a game for 2 to 4 carnies, by Cherilyn Joy Lee Kirkman for Dice Hate Me Games. Pre-order it now on Game Salute! For more information, check out the official Carnival website! • Looking for even more suggestions? Then take a look at the 2010 Dice Hate Me Holiday Gift Guide for even more recommendations!